From Producer James Wan, the director of ‘The Conjuring‘ and ‘Insidious‘, brings us a new twist in horror with first time Director David Sandberg in ‘Lights Out‘. As Martin begins to develop fears of the dark he turns to his sister Rebecca as their mom grows more unstable due to her depression. We learn that a shadowy figure named Diana is living in the dark and was a friend of their mother Sophie when both were in a mental facility as kids. After suffering from a rare skin disorder and the doctor’s failed attempts to treat Diana’s condition it takes a turn for the worse. Now Diana is preying on Sophie’s family and will go at nothing to have all but Sophie to herself. The film stars Teresa Palmer, Gabriel Bateman, Alexander DiPersia, and Maria Bello. This was one of those films that could’ve been a straight rip-off of ‘Darkness Falls‘ (2003) or Robert Harmon’s ‘They‘ (2002), but instead we get an inventive take on many people’s worst fears of being afraid of the dark. A nail biter is an understatement as David Sandberg focuses on the light and how terrifying it would be if something was living in the shadows. My overall impressions of the film was that it was excellent and had a well-rounded cast that not only served for the purposes of the movie but also gave us reasons for caring for the characters as well. Never was the movie dull nor did it skip a beat as it followed a tight pace in its 82 minute runtime. As we mentioned before, what many horror films lack is in character development. Rather in ‘Lights Out‘ everyone plays a contributing role to where we end up caring for all of them in some way. The movie also does a good job of following the mom played by Maria Bello and her daughter Rebecca (Teresa Palmer) when both of them go back and forth when it came to the safety and concerns of Martin. Seeing from each vantage point and how screwed up the family has been over the years you could only but appreciate the balance in their development as characters. Which then leads us into the shadowy figure herself, Diana, who without giving anything away plays an integral part with Sophie. Diana is also just a freakishly looking entity with an interesting backstory that can only be haunting from first glance. The movie is well-paced with one of the best opening sequences that will surely get under your skin. It had me in suspense from the very beginning and didn’t let up until the very end. Just the idea of Sandberg exploring the dark and by creating a compelling story to go along with it is a testament to film makers in the genre of horror. It’s no surprise that he got a little help by James Wan who is currently the go to guy for horror movies and has a way of using audiences fears as we’ve seen in his past films. Every time you’d have a character play with the light and seeing Diana from one moment to the next was terrifying only because you didn’t know where she’d be the moment the light went back on. The thought of what you cannot see is just as frightening of what you can see. Being that this is David Sandberg’s first feature length movie he did an incredible job. Not only did ‘Lights Out‘ keep you on the edge of your seat but you also were able to care for everyone as well. The performances by Teresa Palmer and Gabriel Bateman were great along with a minor role of Alexander DiPersia, who as Rebecca’s boyfriend, brought some comic relief when needed. That was something that worked to its benefit as well when there were funny moments to help ease the tension when Diana would run amok. Best thing to do is to go into the movie with very little knowledge or exposure to the trailer. If you want to freak people out who haven’t heard of ‘Lights Out‘ then you’ll definitely want to take this ride. What do you guys think of ‘Lights Out‘? Are you planning to go watch the movie? Comment below and share your thoughts. As the movie season enters into the Summer, movie-goers are hungry for a satisfying horror movie. Up until now Hollywood has struggled in that department; that is until James Wan announced last year that he would return to the world of horror after finishing up ‘Fast and Furious 7‘. And with production coming to a close, he would announce that ‘The Conjuring 2‘ would indeed be his next project and continue the case studies of Ed and Lorraine Warren. After a rousing success with the original 2013 hit and a less then stellar spin-off in ‘Annabelle‘, fans are clamoring to see the franchise return to form with James Wan directing the sequel. So with that in mind, did ‘The Conjuring 2‘ live up to the hype of the original? Maybe so, but that’s nothing to knock at as it truly has a strong footing. With the return of Vera Farmiga and Patrick Wilson in their leading roles as Ed and Lorraine Warren, they venture out into one of the most diabolical cases in history as the Hodgson family in Enfield England experience terror as a spirit slowly destroys the lives of a mother and her four kids. As the mystery goes deeper and sanities begin to reach a breaking point, Ed and Lorraine’s spirits are tested and could potentially lead to their end. The film also stars Madison Wolfe, Frances O’Connor, and Simon McBurney. Having seen the original film I was a huge fan and it really catapulted James Wan’s career as a horror director. What made the original so great was the focus put on the characters and you actually caring about them when things go bad. Also, the cinematography was what really stood out as it built tension and suspense. Some may criticize the children in the first Conjuring for being annoying but shouldn’t be at fault as most of the attention was put on the mother, played by Lili Taylor, as she slowly became possessed by the demonic spirit of the evil witch. Where the first movie may have struggled, the sequel rights itself as the children become the focal point. There’s a lot to appreciate in ‘The Conjuring 2‘ as most of what’s liked is in the little details. Without giving anything away in spoilers, in the opening of the film we get another introduction to a case study; however this time being where the last movie left off with Ed and Lorraine Warren venturing to Rhode Island and visiting the Amityville home. This to me was a great opening to the movie as we got to see a glimpse into one of the most well-known and most publicized hauntings that would then get into the hands of Hollywood. With the right amount of attention and focus the movie doesn’t spend too much time on the Amitvyville story; rather it builds into the paranormal events that we would then see in the Enfield case. The wrongs that most films do is done right by James Wan and his abilities to not sway away from conventional wisdom. We’ve already been introduced to the Amityville story with numerous films and what Wan succeeds in is not retelling a story that’s been done time and time again. As for the focal point of the movie with Janet Hodgson (Madison Wolfe) being manipulated by the evil entity, Wolfe does an amazing job. Not only do you care for her as she tries to prove everyone wrong, but she also has that innocence that most kids would have at a young age. Most of the time in movies people are cast without thought of how they are perceived by audiences. This can sometimes lead to a disconnect; especially when they are in a lead role. There even has to be praise for Frances O’Connor who plays the mom as she delivers a good performance as she tries to keep her children safe when the media begins to come into the picture. The casting was superb in this film which leads us to another strong performance by Vera Farmiga and Patrick Wilson. Their chemistry together is seamless and leads us into rooting for them when things turn upside-down. Even when the media begins to question their beliefs and close encounters with the paranormal, they may start to rethink a continuing venture into the unknown but doesn’t stop them when the Hodgson family come into the picture. There’s a moment when the importance of family is brought into play and how togetherness is what will prevail anyone or anything from tearing them apart. With overall satisfaction, we can potentially see future sequels of Ed and Lorraine Warren and their case studies as Wilson and Farmiga have become the staple of the franchise. Now it’s not to say that the movie doesn’t have its flaws as the scares we got from the original don’t quite live up here. The first movie was atmospheric with dread; however, here we have a combination of ‘Insidious’ and Conjuring effects. The movie says the Enfield case is the most “diabolical” of them all but I would beg to differ by saying the first movie lived up to that monicker. In ‘The Conjuring 2‘ it’s more so a poltergeist where a spirit haunts the home and isn’t afraid to reveal itself to the outside world. The movie does have tension and some visually terrifying moments that only showcase the strengths of James Wan who knows how to respect the horror genre without resorting to violence as most horror films now-a-days falls victim to. So going into ‘The Conjuring 2‘ you will notice a slight difference in the scares which only benefits the film from falling into retread territory. After all that was said and all has been seen, ‘The Conjuring 2‘ is a solid sequel to James Wan’s original. Though it may not live up to the original, it definitely makes up for it with strong performances and a spooky tale to be told. Where most sequels fail, Warner Bros. and James Wan do justice and only promises more sequels to follow if and when ‘The Conjuring 2‘ leads to a box-office success. What do you guys think of ‘The Conjuring 2‘? Do you plan on watching the movie? Comment below and share your thoughts. In the next chapter of Ed & Lorraine Warren’s spiritual encounters the first photograph released by Entertainment Weekly hits the web (See Below). Patrick Wilson & Vera Farmiga return alongside Director James Wan as the Warrens explore a mother of four kids who are experiencing terrifying moments in their home out in England. Little can be said what the photo depicts but rest assured that little girl isn’t so calm by what she’s seeing. Even creepier is the fact that a line of crucifixes are shown in the background. The movie is set to release June 10, 2016 and should have fans of the first Conjuring coming out in droves. 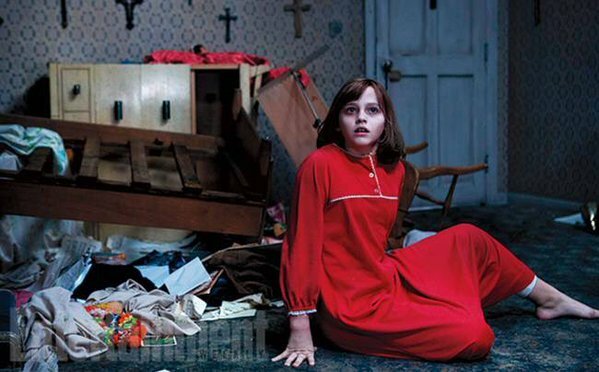 Can ‘The Conjuring 2: The Enfield Poltergeist‘ top 2013’s mega hit? There’s only six months to find out.